Last year’s Periodic Review Report (PRR) cycle saw Standard 3 (Institutional Resources) rise to the second most-cited standard in requests for follow-up reports. 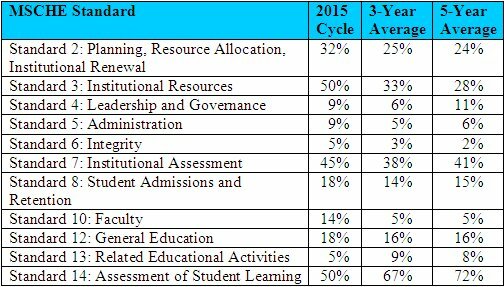 During the 2015 PRR cycle, Standard 3 was tied with Standard 14 (Assessment of Student Learning) as the most-cited standard in requests for follow-up reports. Half of all such requests concerned Standard 3. During the 2015 cycle, 58% of PRR reports resulted in follow-up requests. That figure is somewhat above the 5-year moving average of 53% and close to the 3-year moving average of 56%. Schools receiving follow-up requests were cited for an average of 2.5 Middle States Commission on Higher Education (MSCHE) standards. The 5-year moving average and 3-year moving average are 2.3 and 2.2 MSCHE standards respective. Last year’s PRR cycle saw institutions receiving follow-up requests cited for an average of 1.9 MSCHE standards per follow-up request. During the 2015 cycle, 27% of institutions were cited for more than 3 MSCHE standards. That’s 67% above the 5-year moving average. The 2015 PRR cycle saw MSCHE issue citations for 11 of its 14 standards. The only standards not cited were Standard 1 (Mission and Goals), Standard 9 (Student Support Services), and Standard 11 (Educational Offerings). Standard 1 has not been cited in any requests for follow-up reports during the last 5 years. For those interested in MSCHE trivia, the last time Standard 1 was cited in a PRR follow-up request was 2010. Then, there were three such references. Given the continuing increase in Standard 3 citations, a closer looks is in order. This closer examination will be covered in a subsequent blog entry in December. The data reveal that institutions in New Jersey and Puerto Rico have received Standard 3 citations in follow-up requests at an elevated rate over the past three PRR cycles. To balance sample size issues with the recent rise in Standard 3 citations, a 3-year timeframe was used. New Jersey’s deteriorating long-term fiscal position may be driving the outcome in that state. There, 83% of institutions receiving Standard 3 citations are public colleges and universities. However, some measure of caution is required, as New Jersey’s public institutions received Standard 3 citations in 45% of follow-up requests. Moreover, 85% of New Jersey’s public institutions that submitted PRR reports during the 2013-15 period received follow-up requests vs. 60% of their private non-profit counterparts. That means other factors are likely involved, as well. Puerto Rico’s issue is likely the result of that Commonwealth’s prolonged macroeconomic challenges, declining population, and severe fiscal difficulties. This entry was posted in Accreditation and Assessment and tagged accreditation, assessment of student learning, fiscal, institutional assessment, institutional resources, Middle States Commission on Higher Education, MSCHE, outcomes, Periodic Review Report, PRR, Standard 14, Standard 3, Standard 7 on November 30, 2015 by Don Sutherland.